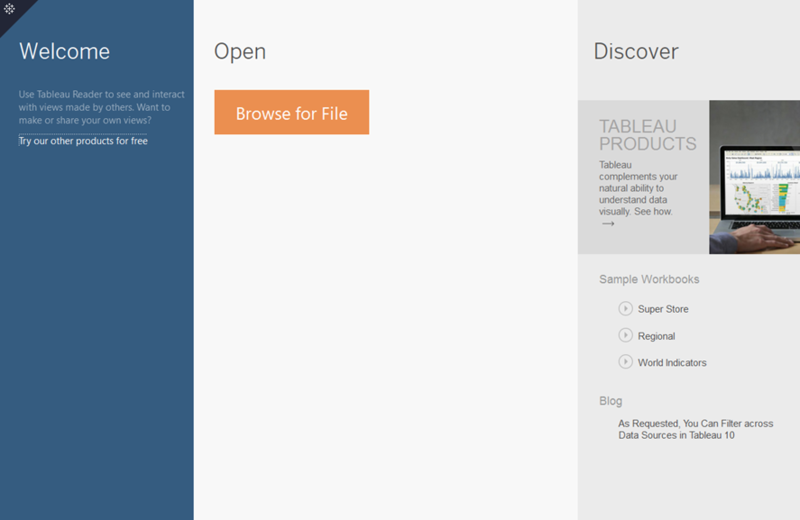 In Tableau Reader, you can open packaged workbooks that were created using Tableau Desktop or Tableau Server. Packaged workbooks, saved with a .twbx file extension, contain the workbook along with a copy of any local file data sources and background images. The workbook is no longer linked to the original data sources and images. Packaged workbooks only connect to local file data sources such as Excel, Access, data extracts, and text files. Click Browse for File on the Start page and navigate to the location of the workbook using the Open dialog box. Note: This button only appears if you have no other recently opened workbooks in the pane. Select File > Open and navigate to the location of the packaged workbook using the Open dialog box. Double-click on any packaged workbook file. Drag any packaged workbook file onto the Reader desktop icon or onto the running application. Click the Open a workbook link and select a workbook to open. Note: This link only appears after you have previously opened at least one workbook. When a workbook opens, the worksheets and dashboards are shown as tabs along the bottom of the window. Note: If the workbook connects to a Microsoft Office 2007 data source (Excel or Access), you need to also have Microsoft Office 2007 installed on your computer. You can also ask the author of the workbook to save the data source to a version that is compatible with your software.